This entry was posted in Eberron FAQ, Gaming Features, Phoenix: Dawn Command, Uncategorized and tagged Eberron, Phoenix, phoenix dawn command by Keith Baker. Bookmark the permalink. I am sold. If I had the money, I’d buy Phoenix right now just to be able to play this. I’d love to be able to try this out, especially with some of my friends who are experienced enough in D&D to think Goblinoids are always monsters. Ummm… yes please! This sounds awesome Keith! Now I really need to get my hands on Phoenix! That is amazing. How would you compare preparing for PDC vs preparing for a more traditional RPG from a GM’s perspective? How would you compare preparing for PDC vs preparing for a more traditional RPG from a GM’s perspective? Definitely easier than many. It’s a simpler system than D&D or Pathfinder, so preparing challenges is quicker. The core set comes with a seven mission adventure path, which can be used as is or as inspiration. Obviously it’s easier for me than for most, but I’ve also come up with adventures on the fly before – taking a few existing challenges and building a story around them. Absolutely would Love a Phoenix Dhakaan pdf. This sounds like such an amazing idea to explore Phoenix and one of my favorite periods from Eberron. Without stepping on Eberron toes, I would love to learn about the Empire that supports Dar Phoenixes. I don’t exactly understand how it is justified, in Eberron cosmology, that goblins start coming back as Phoenixes. It’s not actually that hard to justify. In Eberron, Phoenixes are Deathless: undead that are sustained by the energy of Irian. Phoenixes can only return in Aeries; in Eberron, those would be manifest zones tied to Irian. Deathless are sustained by mortal devotion; in Dhakaan, this would be drawn from the unity of purpose of the people of the Empire. Phoenixes might not resemble the Deathless elves of Irian, but there’s nothing strange about that; wraiths, vampires and liches are all Mabaran undead, but have little else in common. In modern-day Eberron, the Dar have forgotten how to maintain the Aeries and there’s aren’t enough of them united in purpose to sustain Phoenixes. But that could change if one of the Dhakaani factions united the others and restored Aeries. Ps i read your articles on mror holds: very interesting. Thanks for them too. one of My 5e eberron games involves certain past lynchpin/world altering events starting to unwind. While things are still early in that regard, they will almost certainly involve the dhakaani period… so I’d love to see most anything about a generic empire of goblin assassins and hobgoblin bards facing an invasion of horrors from beyond time and space. I would think that stacking a few levels (or more appropriately a Mythic rank, if using Pathfinder) every time a PC dies can quickly unbalance a game. Which lead me to thinking, how is the power difference between player characters addressed in Phoenix then? Good question, and I’ve added my answer to the end of the post. The short form is that the systems have dramatically different design goals. D&D has more of a simulationist bent and relies on the random element of the die roll. Phoenix is more cinematic and places more narrative control in the hands of the player. In Phoenix you know what resources you have to work with at the start of your turn and decide how to use them – essentially, you’re rolling your dice BEFORE you declare your actions, while in D&D you declare your action and then see what happens. There’s less wasted action in Phoenix which is critical because the odds are usually against you; you are searching for a way to beat those odds, and we don’t need to have dealing with crappy die rolls on top of that. You may get a bad hand of cards but a) You KNOW that’s what you have to work with, so what can you do with it? and b) because each player has their own deck, if you have bad cards now you have good cards coming up. Another example is that in D&D, the value of an attack is determined first by the random roll to hit, then by the random roll for damage. You usually don’t know exactly how many hit points the enemy has left, and even if you did, there’s often little you can do – if you know the opponent only has 5 hit points left, you can’t do something that lets you do an extra five points of damage. In Phoenix none of these things are random. You know what you need to hit. You know what you need to play to injure them, and you know what it will take to defeat them. And if you have enough sparks, you can burn them to do that extra damage it will take to kill them… you just have to decide if it’s worth it to spend those sparks, since you’ll die when you run out. It’s about choice, not chance. So you’re saying that, because in Phoenix no action can have an unpredictable outcome, it’s essentially impossible to convert to a dice-based system. I’m a big fan of a mix between the two — randomness keeps combat fresh and exciting, whereas a small pool of guaranteed success means players always succeed where it counts for narrative purposes. So what I’m really looking for is some kind of hybrid system. Mundane heroes and monsters run on luck and skill, but mythic beings like Phoenixes, dragons, and gods would have certain amount of control over fate. I’m specifically looking at the 5e’s Legendary Resistance trait on some monsters, which basically allows the creature to choose when to negate an attack. Would it make sense, in a hypothetical D&D game of Phoenix, to give them such abilities? Say, the spark pool could be spent to automatically succeed on skills, saves and attacks, or alternatively to force an enemy to automatically fail on those things? Not at all. Anything is POSSIBLE. It’s just not trivial. The two systems are very different, and PDC is inherently designed with Phoenixes and action/suspense in mind. I’m a big fan of a mix between the two — randomness keeps combat fresh and exciting, whereas a small pool of guaranteed success means players always succeed where it counts for narrative purposes. To be clear, there’s randomness in PDC. You’re working with a deck of cards, and what you have to work with from turn to turn is random. It’s simply that at the start of a turn you know what you have to work with before you commit to an action. And if you DON’T have what you need, you may be able to get there by using an environmental element, narratively justifying a trait, getting help from a friend, or as a last resort, burning sparks. It’s a more active process than rolling a die. Sure: it would make sense to give Phoenixes a Spark pool that could be added to Attacks, Skills, or Saves, and for Phoenixes to have a few concrete supernatural abilities that you can trigger by burning Sparks. Another thought about this: In PDC, when an enemy attacks you, the default is that they’re ALWAYS successful. There’s no chance that they’ll randomly miss; unless you do something, they WILL hit you. The issue is that to defend, you have to use cards you could otherwise do to take actions on your next turn. So often you have people choosing to take damage they could avoid, because it’s more important to make a successful attack. Essentially, the fact that your defense and offense are directly linked is part of what leads to the idea of sacrifice: is it more important to survive or succeed? So you can definitely get some of this experience by giving Phoenixes reaction abilities that let them mitigate enemy attacks; but you’d also need an interesting reason NOT to use these abilities, if you’re trying to get the same experience. So for example, I can use a reaction to reduce damage by 10, but if I DON’T, I can use that same thing to add 10 to the damage of my next attack. 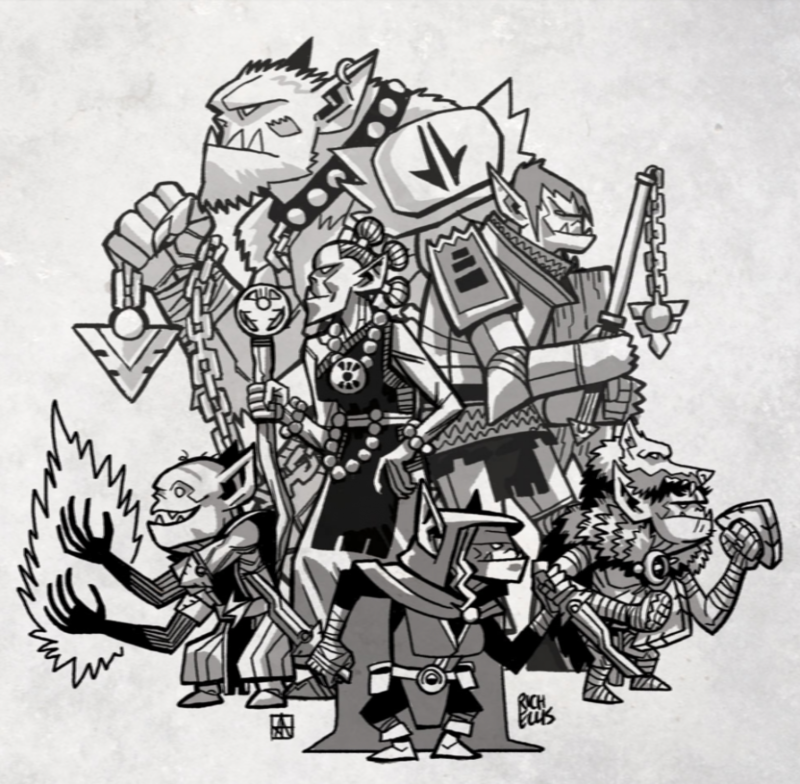 One more “yes please!” vote on the Goblin Wars pdf — that’d be fantastic! Bit more of a cust serv question for a change. At the end of the article you say Phoenix is about $60 USD. When I go to the website, I get quoted $88 CAD (approx $70 USD). Where is the extra $10 coming from? International shipping? I believe what’s going on is shipping, yes. We’re providing free shipping within the US, but outside the US shipping is a factor. If that’s NOT what’s going on – if it adds a shipping charge ON TOP of that – then something is wrong; if that’s the case, please let me know. Thanks for another great post! Eberron is amazing in how rich and adaptable it isn’t without falling into incoherency like some other settings might. A particular question of mine: How would the rebirth as a Pheonix affect the eusocial bond the goblinoid species have with each other? Do the transformations tend to reinforce the existing roles or grant a new level of freedom to diverge from them? Is the process itself something like a fourth (or forth through ninth?) new species with their own rolls?